This is the first Marvel-esque thing that I have read (technically I read an Anita Blake graphic novel put out by Marvel, but I’m talking super heroes, etc.) and I really enjoyed it. This story is about Kamala, a girl who comes from a Pakistani family living in Jersey City. Kamala is in high school and she is struggling to fit in with her peers and keep the values that her family believes in. One night, she sneaks out to a big party but ends up leaving after being there a short time because people were giving her a hard time for sneaking out and not drinking alcohol. As she is leaving, a weird fog takes over the city and she meets three super heroes: Captain American, Iron Man, and Captain Marvel. Captain Marvel asks Kamala who she wants to be and she ends up with super powers at the end of their meeting. 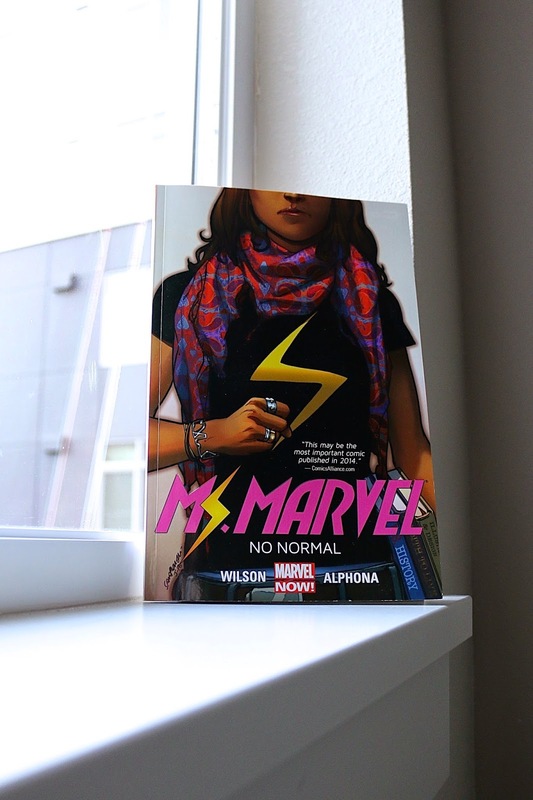 The rest of the novel is Kamala dealing with her extra abilities in a world where no one else has them and what to share vs. what to hide. I really enjoyed this story; it is relatable in that who doesn’t think that if they just had _____ their problems would go away? I look forward to the second volume coming out in April 2015!